Well, I made it to Brighton…yesterday! I’m always impressed by European rail systems in regards to how easy it is to get between destinations. While there was nothing stand-out about the train journey from Lewisham to Brighton, it was certainly easy and pretty quick. Jason and I met up in Lewisham and then found our friend Bill at London Bridge, where he had traveled after he landed at Heathrow. From there, it was off to Brighton. Easy! 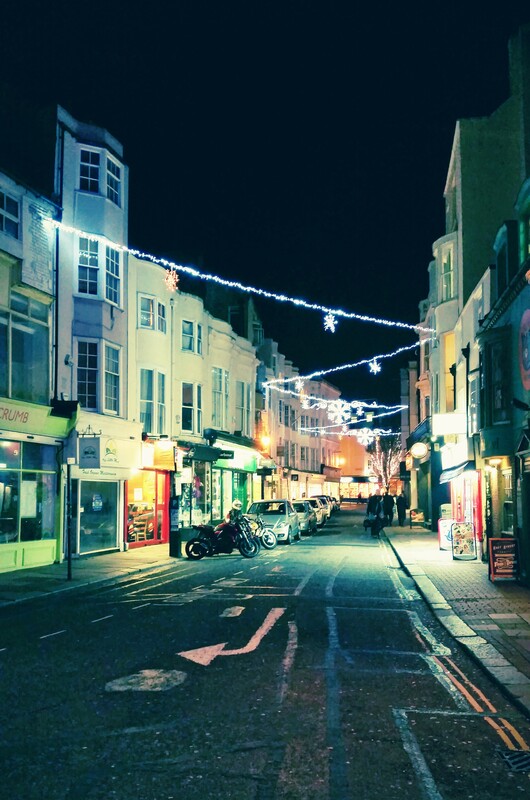 I haven’t been to Brighton for at least a couple of years, so it’s great to be here again! I’ve always been here with other friends and never stayed for more than a day, so I haven’t ever had to do much navigating here. Luckily, we seem to be pretty close to everything we want to get to. Getting from the train station to our hotel was really quick (about a half-mile away) and then we had to walk maybe another half-mile to get to Bill’s hotel. Funnily enough, none of us are staying at the hotel where Timey Wimey is happening, but it’s very nearby, so we’ll have an easy walk there. Travel tip – especially when you have multiple friends staying at multiple locations when you’re on a trip together, peek at Google Maps *before* you all arrive to understand the lay of the land. When we did that, it looked like all the places we would want to go were pretty centrally located to each other and that has definitely proved to be the case so far. Win! So what did we do on our first day in Brighton? Ate and drank, of course! No really – that’s kind of all we did. And it was great! Because the weather gods weren’t shining us in Brighton as they were in London, it was cooler, greyer, and sprinklyer (not a word, but hey, it’s my blog), so we decided we would just head somewhere for lunch. We came across Pitcher & Piano, which I’m told is a chain, but none of us had heard of it before, so we gave it a try. The place was pretty empty when we arrived, so we ordered some drinks and food, had some great conversation, and the next thing we knew, it was five hours later! Oops. But hey, we’re on vacation! Bill was in the same situation I had been a couple days earlier – he had just arrived in the UK that morning, but he was staying awake like a champ. We debated going back to our hotels and then going back out, but decided we would just solider on, so onto Charles Street we went. It seemed like a nice bar/club with some great happy hour drink specials, so we spent another few hours there, chatting about everything under the sun. Our friend Neil (who lives in Brighton) joined us later in the evening, so it was great to see him! So now you understand why this blog happened today instead of last night – five hours at lunch plus another few hours at a bar (plus a stop for late-night kebabs for Bill and Jason) means we didn’t get back until around 1a, which is far past the time I normally turn into a pumpkin. But a decent night’s sleep in a really comfortable hotel (thank you, Premier Inn!) left us feeling refreshed today. Well, I feel refreshed – not so sure about Bill and Jason. Four bottles of wine will knock most people on their butts! 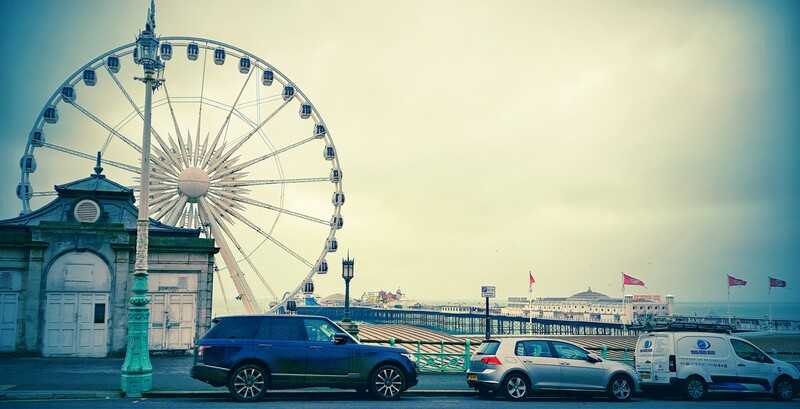 A quick shot of the Brighton Wheel, which is right at the end of the street Bill’s hotel is on. How I spent my afternoon/evening (photo courtesy of my fabulous friend Jason). More Christmas lights (these were spotted on the road our hotel is on). And now, it’s already nearly noon (guess we slept in today – oops). Time to go out exploring soon, I think! A five hour lunch? That must have been one helluva conversation. 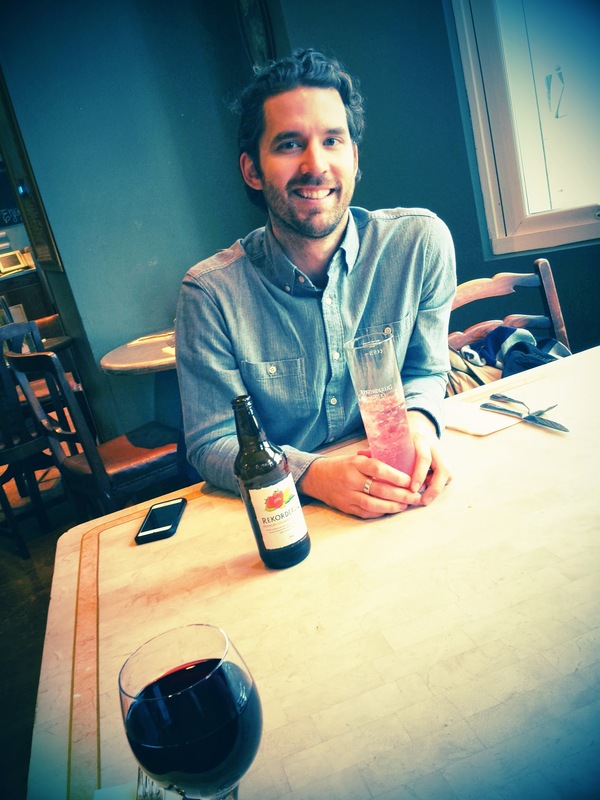 I like your pink drink selfie – you look great! Thanks. 🙂 And our conversation didn’t feel like a five-hour one nor did it follow a linear path. Just what happens when you get together with friends you don’t see often enough!